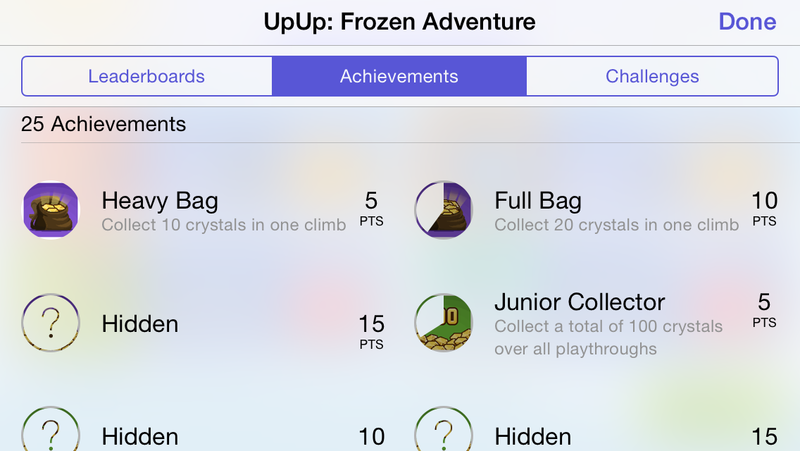 UpUp: Frozen Adventure (Free) by developer Sioux is a fresh take on iOS puzzle platformers. The crux of the game is to guide an unnamed hiker safely up the mountain before he freezes to death. There is a health bar in the upper lefthand corner that slowly empties as you get colder and colder. The goal is to balance speed and collection strategies, as there are small yellow gems scattered throughout each level. The level design is simplistic, focusing on a series of slippery steps and ledges rather than puzzle-solving in order to advance. At first I was underwhelmed; timed trials and slippery/icy level designs are some of my least favourite aspects of platformer games. It was all too easy to glide right off the edge of a cliff and into a canyon full of deadly icicles. And my health meter depleted so quickly I barely made it 1/4 of the way up the mountain (you see your climbing height at the end of each level). However, after the first (of many) deaths, I was taken to a screen where I could spend my collected yellow gems on speed, jumping height, stability, and health. Next time I climbed, I was able to get much higher by decreasing the amount of uncontrolled sliding by upgrading my stability. This made the game much easier and more enjoyable, although I still hadn’t made it to the mountain peak yet. Each new game cycles through different, randomized mountainscapes, so you aren’t climbing the same slope every time. 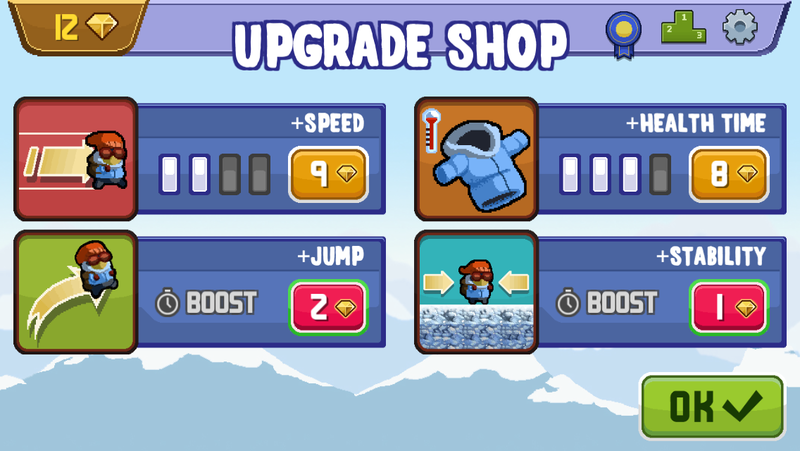 By upgrading one of the four options listed above, the player can tailor their climb to their own play style. There are also “Safe Houses" along the way that provide items for a temporary boost in speed, etc. I left speed alone for the most part and focused on stability and health. There is a certain satisfaction to improving your character and watching the progress increase. I would still prefer the typical “solve the puzzle and move on” platformer game, but it was still interesting to see UpUp subvert those expectations. Having just come off of playing Dinofour, it was a welcomed change. Once you have character stats that satisfy you, however, there’s not much else to do. It reminded me of the Jumping Finn Turbo Adventure Time game ($0.99), where once you upgraded all your items and made it to the finish line, that was it. This is the unfortunate drawback of stepping away from the puzzle-a-level style of platformer. Upon beating UpUp, you will unlock a “Run Timer,” so you can try to outdo your personal best and make it onto the game high score chart. It started to feel more like an endless runner by the end. New obstacles were introduced infrequently, which is a shame. There are a series of unlockable achievement, but I’m not particularly compelled to collect them all. There were also some graphical issues where the dark hills in the background would flicker as you ran; which isn’t a huge problem in itself, but when you combine that with the constant flow of snowflakes on the screen it can be quite dizzying. I think with a little bit more to do, this game could have been great; but for a free game, it was still quite good. I think I’ll stick with my solve-a-puzzle platformers for now. Next PostNext New ‘Hearthstone’ Tavern Brawl Available – Randomized Decks!